Pretzel Logic's Market Charts and Analysis: SPX Update: Was That It? 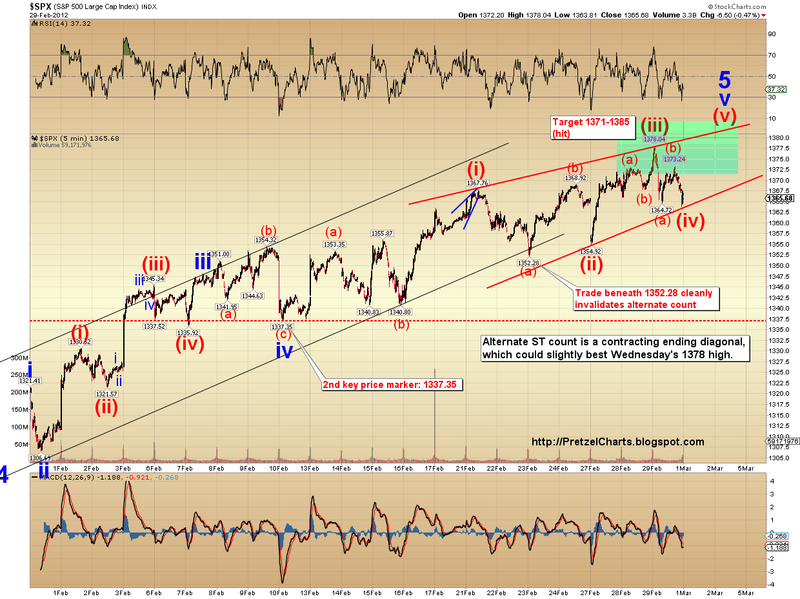 SPX Update: Was That It? For several weeks, I've been talking about the Fib zone at 1376-1378 and how I felt that could act as a magnet for the rally. 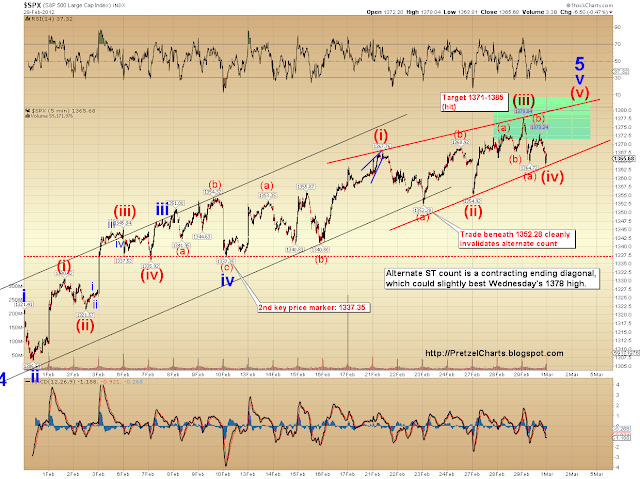 Yesterday, the SPX hit 1378.04 and reversed. Could it really have been that simple all along? There's no way to know for sure yet, but the market has now satisfied the requirements of the preferred count's 5th wave up -- and it may finally be time for the larger correction bears have been waiting for since Santa was in town. 2. Commodities took a beating. 3. The dollar formed a bullish engulfing candle. 4. The ECB "anticipation" is over. Sellers don't have to be scared of it anymore. There are a couple ways to view the very short term structure, but I'm sticking with the expanding ending diagonal as the preferred count. This count says the top is in, though it may not be the monster top bears are hoping for -- I'll discuss that big picture outlook in more detail in the final chart. The wave structure at micro degree is a total mess, so it's also possible this is part of a contracting ending diagonal with one more new high to come. Below is the alternate short term count. I like the preferred count better, for the reasons previously mentioned, but the only way to rule out the alternate is with trade beneath 1352.28. Normally, I'd use the wave (ii) bottom, but the structure's messy enough that I'm allowing leeway for counting errors. If the alternate short-term count below ends up playing out, it's fairly common for wave (v) to overthrow the upper trendline in a false breakout. If that happens and it keeps rising, bears should get out of the way -- but if that overthrow happens and the market then breaks back below that upper red trendline (whipsaws), then that's an excellent place to get short with stops at the newest highs. Now, if the alternate count shown above is invalidated, it does not mean with certainty that the preferred count is correct. These are not the only two options for this market. Because of that, I'm recommending that the support and resistance lines on the 10-minute chart below be used as better trade indicators. Yesterday, the market closed right on trendline support. Below that, the next important support comes in near the 1352-1355 level, then at 1337 below that. The blue line is overhead resistance, as are the recent highs. Finally, the big picture count below. The preferred view is that wave (iii) is wrapping up, and the market is now entering a fourth wave correction, with another leg up still to come. There are two big picture alternate views I'm considering. The first alternate (shown in gray on the chart below) is that the market is actually now in the process of forming a major intermediate top, and from here would head down to test or break the October lows. I would give that count maybe 40% odds vs. the preferred big picture view. The second alternate (not shown -- for the 2nd alternate, see the last chart in this article) is that the market is in the process of forming a very large ending diagonal (c) wave. In that 2nd alternate scenario, the market would bounce around significantly, but still remain above the October lows for some time. 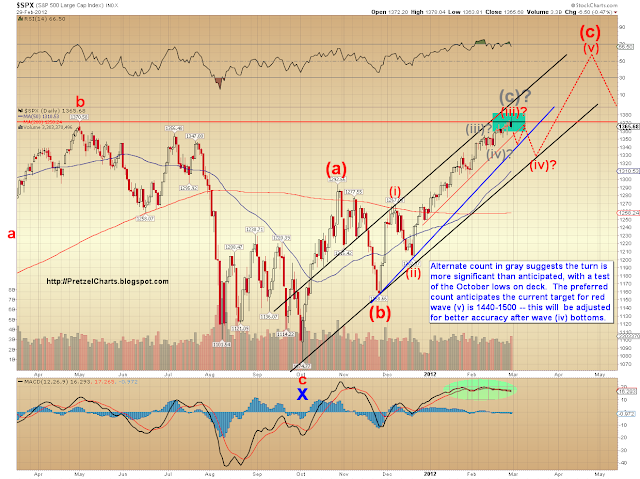 Final confirmation of trend change occurs at 1267 SPX. So the market could conceivably fall 100 points, and still be in a larger uptrend. It's also important for bears to note the three rising trend lines, which should theoretically act as support -- although neither the blue nor black line have been tested recently. In conclusion, there are reasonably good odds that we are on the cusp of at least a short-term trend change. This was the zone we've anticipated for most of the month, and the micro structures now seem to be confiming the larger wave count we've been watching since February 8. The supporting evidence across other markets is encouraging as well. There are no clear invalidation levels right now, but the support zones are pretty clear. If you didn't get short at the Fib 1376-78 target yesterday, then it's usually advisable to wait for a retrace rally before shorting, since most half-way important tops are retested. Conversely, one could play off of the support and resistance zones, using them as entry and exit/stop loss points. Trade safe. Morning PL - great post as always. Can't believe how much I have learnt in the last couple of months but especially this year - finally got to stand back a few weeks ago and be patient and just learn a bit more each day. Thanks for the work that you put in. lol, ohhh, never mind. tired of the violins on tv. . .
today looks to be an up day, or at least during the mornin', might be choppy from now for a hour of two. I'm wondering if this is part of an expanded flat, with a and b done, c-up to come. Your concern about positing and weighting alternate counts being a liability is unwarranted. The multi-count approach is instead the major asset of your work, imho. Given the propensity of humans to see and hear self-confirming ideas, the opportunity to view alternatives that would be otherwise missed...is invaluable. I do also like the idea of publishing the preferred and alternate counts on their own separate chart....distinct images for distinct concepts. Sincere thanks for your unique site and excellence of endeavor. Good Morning PL, awesome post. nice article Pl.. also, i just heard a floor trader i like Jeff Kilburg say a bit ago from CME floor that yesterdays drop ' mini flash crash' was a 'miss click' and sent algorithms to sell off. old school term 'fat finger trade'. i'm sure this doesnt help the chartists very much.. any thoughts? yeah, dunno, play short and small and only when a real direction appears. while there is no such thing as a sure thing, my system I have developed over the years has narrowed down the possibilities pretty well as well as the tgts. I only take trades I am pretty sure of. Now, where did my ouija board go? Glad you're not upset at my stance, and no I wasn't emotional about it either. I was however wondering why you would be seemingly dismissive about feedback you solicited.. The phrase I've repeated here is just my perseonal manifestation of the disclaimer on the right, and so I'll simply repeat that as often as others repaeat the phrase "not trading advice". Nice charting again today..... oh and I like today's headline better than yesterdays!!! $RUT has a spectacular fall of 1.56%; $SPX was down .47%; $DJIA down .41%; $TRAN down .23%. This is what makes this mrkt so hard to follow, nothing is in context. If you remember days back I mentioned that the $TRAN was down much larger than the others, percentage wise. Ideally these should all be in context of each other, roughly. Mrkt dynamics are thinking about what to do, mrkt is always right, but confused at this point. All will ratchet down (or up) at some future point, together. This will provide an all clear sign for longer term plays. It was probably an intentional fat finger mistake to take out all of the stops before taking the market back up again today. No Island Reversal in AAPL yet. Excellent and very clear article today. Thank you, PL. Prechter has it, as I heard. Shorting gold for a while with a stop at 1790... Then the sp short since a LONG while with the stop at yesteryears top... he is really giving EW a bad name. Cannot help it. But maybe I do not get to know his good calls. thanks Katzo, u r definitely are on top of it. he was pointing out the actual trade that he is referring to but i didnt catch it. Eur has gone from 1.3480-ish yesterday to now below 1.33, to 1.3295 this a.m. That is a HUGE move for a ccy. Not sure I buy the whole 'fat finger' explanation. I think some asset manager just wanted out and his trader did it in a clumsy way, or he/she panicked and just ordered the trader to 'get out now'. chart posted 2/25, very clear channel. He called the top in 2008 and then the bottom in 2009. No one is always right. If it wasn't for him, you'd probably not be aware of EW. Thanks much...so what I'm getting from the ISDA statement is that it won't declare a credit event until the CAC's are actually implemented. Yes folks...and that is why he won't do two shows a night. Katzo, reset finished!! do you see us going higher from 1368, to test yesterday's high? yes, higher but not necessarily a test of recent high (throw-over). hard to say if another throw-over occurs. . .
no one seems to care about Greece anymore, unless it declares bankruptcy, which it already is and everyone knows. All Greece news are non- news. wow look at that long wick, stop grabber, or future price target? was it up or down? imo AAPL has been floating some indicies and not others. RUT and TRANNIES don't count AAPL I believe. imo AAPL will need to correct some for context to return. AAPL is almost as large as the entire retail sector and is larger than the entire semi-conductor space. This is just my opinion. I agree with you katzo7 on the context being out of whack and the insanity it is causing. Just a theory to shoot holes in here. Greece is going to default and the market knows it. I read the 10 year CDS rates imply a 94% chance of default in that time period with a .22 recovery rate (=78% haircut)...The only unanswered question is when they leave the Euro. How big is the damage according to EWT, the fact that we just went above yesterday's 2pm peak? TIA! The Wizard set to testify this AM - curious if he refines his message a bit today. Not sure if will hold up, but this is looking a lot like 12/8-9. 12/8 was a key reversal day like yesterday. 12/9 retraced a lot of that down move and closed up. Then the sell-off continued the next several days, bottoming 12/19 at 1199. Both ISM and construction spending below estimates. Nice, that backtest of previous support (SPX) showed it acting as resistance. Out at 67.75, I need more days like this :) still think we may close solidly green and would rather get out too early than too late. great entry point, look at that long red candle, I love it!! Possible, get to check my teacher. But what he did in the 80s is not helping now. And what I really do not like is his know-it-all attitude and his disregard for strict money management. You can call it wrong and call it wrong. And he calls it wrong wrong. good work and money for 3 minutes work!! I figured that swap deal was a scam as soon as it came out. US taxpayers will take in the end, in the end. short again at 70.75. sl at 1374. 68-69 level likely to be st support. ...due to lack of interest. All I have on board right now is TVIX...I really wish they would rename it SHTF...that almost seems just as appropriate. is someone rattling their saber again?...or are they just adjusting to the drop in consumption. AAPL looking weak intraday. Breakdown coming? Sen. Shelby - "Mr Bernanke why haven't CDS been triggered in Greece? Is this because of manipulation by govt's & CB's? Bernanke - "UHHHH, no sir, absolutely not!" looks like a Doji star on yesterdays's close? lol having 2 of those, one of those, and one of those, is different than having one of those, two of those, and one of those. it's legos. OK, this is something that escapes me. What does "cash equiv" mean in relation to the E's target, and what does "add 4 for $SPX"? dont try to get to cute with this imo, direction is down. . . . they are trying to shake ppl out on both sides. . . .
Bernanke thinking (as he utters "UHHHH"): "Damn it! Even U.S. senators have figured us out!" No sir....I'm a one man woman, er......I mean, I'm a one woman man. i agree, i am just trading st levels of 68-69 as support, 71-72 as resistance. But I completely agree risk is to the downside, if 68 goes today, it will go quick. If es somehow takes out 74, watch out. This is feeling horribly horribly slow and sideways, 4th wave boredom, so is there another leg up here? viz your alt. 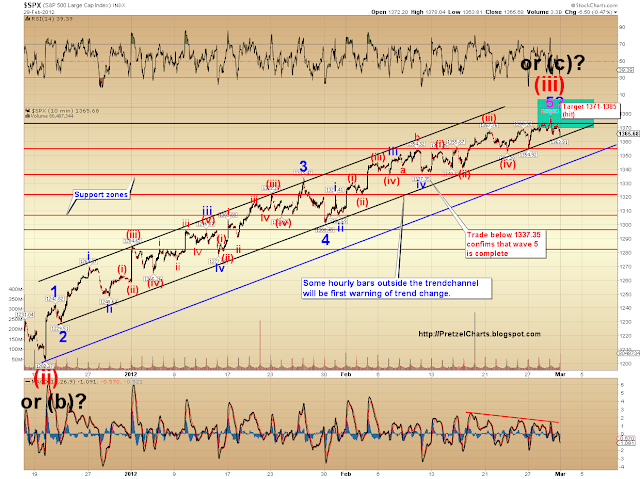 Theoretically the descent should be swift and powerful after an extended 5th or ending diagonal and we have had both? This sure ain't swift and powerful at the moment! Euro is so weak. Still my favorite short target here. I've put the names of two outfits on from where you can get free charting. agree, swings are larger than I thought they would be. . .
PL (anyone)....aud/usd has performed right in line with the SPX. If we are headed higher on the SPX, wouldn't the aud/usd be making new highs as well? Last two to three weeks looks corrective in the aud/usd. DAX lost yesterday until this morning 150 points. until know it gained back 120 points. Long is sitting comfortable here. DJ I expect some up movement, waiting for 13200 until end of week. goons. this market eats little bears for snacks. did I send this to you, it was ready to go but vanished!! Yes. I received it the first time. Thank you. GooNs!! This market eats little bears like you for snacks! 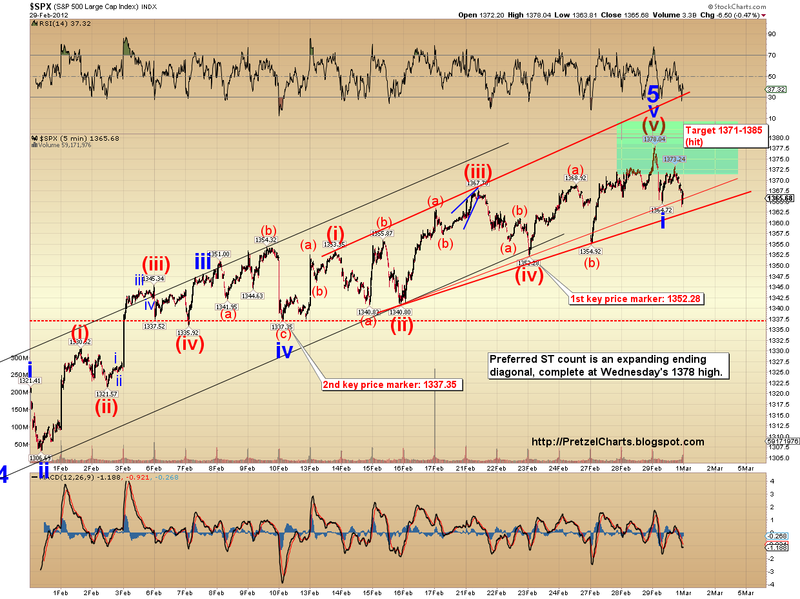 4th wave triangles look on for INDU / SPX and NAS100? worm-can they wouldn’t like to be opened by a default." got a 5 min meas move fib to 1374 from the globex low.......got alot of cars done at 1373.75 so they may want to tick it.......best if not more than 500 or so if they do tick it.........dang it....i got a tick again!! DO YOU LIKE GETTING EATEN? BLAST OFF COMING SOON. WATCH. Manipulation, conflict of interest, etc... etc... etc... Who will call them on it? Government, banks, ECB, and FED all in cahoots. Looks like the SP500 is rebounding nicely again today (up 8 pts as I write this). Next stop 1400. 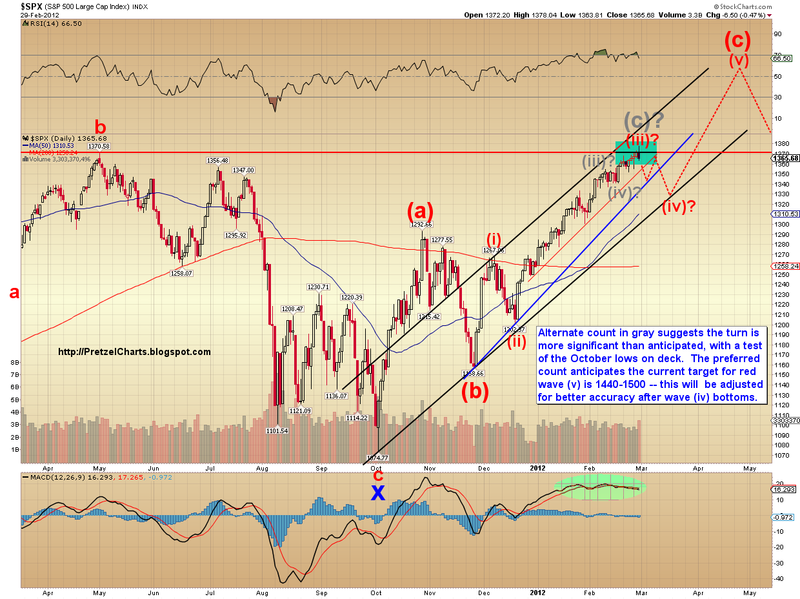 Think we already saw the pullback on Monday when theSP500 retreated to the 1355 range. Onwards and upwards, only good news about the economy fills the media. But even then, the market will probably just shrug it off and keep moving higher. There is always a gap between futures prices and cash prices. Let me know if you want me to explain why this is so. In the case of SPX/ES, the size of the gap depends on the length of time until contract expiry, the SPX dividend yield, and prevailing interest rates. Lately the gap is usually about 5-6 points when a contract becomes front-month (i.e. when it has about three months to expiry) and drops to almost nothing immediately prior to expiry. Right now the gap is only about one point, and that will continue to drop as we approach expiry of the March contract. They are the products of incestuous business relationships. I'LL TAKE ONE NOW AND TWO TO GO. THEY ARE ALL LITTLE SNACKIES. This should not surprise anyone, they went to a lot of trouble to engineer this 'voluntary' restructuring. ISDA = Int'l SWAP DEALERS assoc; those are all the swap dealers. OJ managed to get away with it, you think the swap dealers wouldn't? They have better lawyers and no dna evidence needs to be disproved/ignored. Out of ES short at 73.25 ... scratch. Possible H&S and possible EW count since yesterday's high attached. PL, quick question about amazon shopping. I clicked on your books on the right to go to amazon, then click powered by amazon to go to the homepage, but because I need shipping to Canada, so I clicked amazon.ca on the homepage. Will you still get credit for the stuffs I buy on amazon.ca?? I wish you will. SPX Gann 360 chart, not much longer?? I'm terrible at intraday predictions, but I'm really thinking we selloff now into the end of the day, and it continues on Friday. Reasons: weak euro, weak AAPL on the intraday chart, and a little fake breakout move over the days highs and back under on the SPY. As another reason that probably means nothing, the Russell and Transports also have both retraced 50% of their moves from rally highs to recent lows. Good eye. Just an FYI: you can use the "abc TEXT" button on FreeStockCharts to label your waves. Thanks b_s....good to know. I think I need to study that Gann stuff alot more. Daily VIX update. any input? Well, so far this call sure looks like a dud! Very interesting. If it's really just one or two buyers, that doesn't indicate wide-spread nervousness. Yet. WN, is your "shorting it all" strategy high-probability bet with smart target move? Or a normal probability, with potentially large target move? Mr. Potato Head? He always looks like he's being swallowed by his own jowls. Blind_Squirrel......appears as though you are a Gann aficionado. I have no exposure to the tenets and am wondering if you could apply the Gann principles to two charts for me. Both charts are of companies with long term bases. Both companies should have significant appreciation over the next couple years and I believe both are very close to breaking out. If you have time, could you look at EXAR and INFN from the Gann perspective. If this requires too much work, I'd understand your hesitation. Can today's action be attributed to being 1st of the month fund buying? Thanks. I was toying with the idea also that this might be an ABC correction. This is where I could use PL's help in real time. The big picture is useful to know but the fine counts are the head scratchers. BTW, I have no idea what I'm saying, so take it with a big grain of salt. Was not a friendly animal. Man, those guys in the 1960's striped suits were really packaged! Um, would that be in trade for our support against Iran? Ty. Hope this one "works", as I have been stopped out a couple of times already. I thought maybe Cramer called for SPX-2000 or something. That would certainly be the kiss of death. Sounds like they're betting the vix cash won't rise as much into April as currently forecast by the vix futures curve (out months higher than front currently)...And he's saying the size they're doing this in, isn't moving the implied vols of the vix itself YET, but he leaves open the possibility it could if volume increases or vix cash starts rising. Did you notice how more bearish the DJI looks today than the SPX or the NASDAQ? Could this help the bearish POV? Crazy stuff is going on in central bank land. isreal is buying u.s. equities. Isn't this the retest of yesterday's halfway top as PL suggested in the last paragraph? Still looks a lot like 12/8-9 to me. If tomorrow we test today's highs, fail and head lower the downtrend will continue..I've been trading a lot more than usual today, my broker now says my avg (short) position price is 73.75 and I'm leaning on 75 as a stop. I can live with that. to work in this present market. I liken that comment to those made by companies who that say they are "buying back there shares"....most never do and I think Charles Nenner is an Israeli calling for Dow 5000 in the next two years. His most recent comment about the Dow going down was that it would start after the first quarter of 2012. His homie's buying when he saying SPX top at 1440 and then down to 5000 on the Dow? Doesn't make sense.